May 1st in Wordpress Books by Wordpress Jedi . I have been a big fan of Packt Publishing books for quite a while now. Packt Publishing is the first place I check to find out about the latest open source and web technology books. It does have a ton of books on WordPress and related technologies, so that always helps. WordPress 2.9 E-Commerce, which Packt Publishing was kind enough to provide us a copy with, is not your average WordPress book. It is written for those who want to start an e-commerce website using the WP platform. If you want to sell your physical or information products on the web and would like to use WordPress to get it done, this book is for you. So let’s dig in and see what’s covered in this book (for more information on this book and other exciting Packt Publishing books, visit packtpub.com). Many WordPress users assume that you can only use WordPress to start and manage a blog. That can not be further from the truth. Those who have been around WordPress for quite some time have come to realize the true power of this platform. WordPress 2.9 E-Commerce is written for small business owners and anybody who’s interested in starting an online store by tapping into the power of WordPress. Startups and small businesses may not have the budget to hire developers and experts to build a fancy online shop. In reality, you do not need to be an expert in PHP or other web technologies to get your own shop online. WordPress 2.9 E-Commerce walks you through all the steps you need to take and shows you the plugins and the themes you need to take advantage of to take your store online. Manage Your Product Catalog: you’ll learn how to add physical or information products to your store, categorize your products, and control your stock and prices. Manage User accounts and staff: your store wouldn’t be complete without you setting up proper user privileges. After reading this book, you should be able to easily create multiple user types for your store to handle your customers and staff members. Handle Checkout and Payment: handling payment is going to be one of the most important parts of running your own store. Accepting PayPal and Google Checkout payments are covered in this book. The information on each of these payment systems can come very handy for beginners. Handle Shipping, Taxes, and Processing Orders: if you are planning to sell a physical product, you are going to have to handle shipping and tax per each order. Secure Your Store: the most important part of running an online store is to make sure your store is secure enough for your customers to use. You also want to secure your WordPress install against hack attacks. WordPress 2.9 E-Commerce covers those essential steps you need to take to keep your store protected. Theme Tweaks: you do not have to be a PHP guru to make changes to your online store and customize some aspects of it. This book gets you familiar with the basics of CSS and teaches you how to make basic changes to your store and customize its look and feel all by yourself. What I like about this book is the fact that it’s very practical. It walks you through all the steps you need to take to bring your online store to life. It can also save you a lot of time with your research as the author has done the work for you and has included a list of top e-commerce and third-party plugins you can take advantage of to manage your store more effectively. Practical instructions are provided to enable you to set up your store and start implementing those plugins more easily. I also liked the store promotion chapter, though I wish more tactics were covered. The coverage of Gold Cart Module and WAMP was a pleasant surprise. WordPress 2.9 E-Commerce is not going to make you an expert in PHP nor does it intend to make an e-commerce developer out of you. It’s written for small business owners who want to start selling their products online without spending a fortune on e-commerce development. It teaches you how to manage your products and customers, process orders, secure your store, and even promote it. The screenshots and instructions provided in this work are very helpful as well. 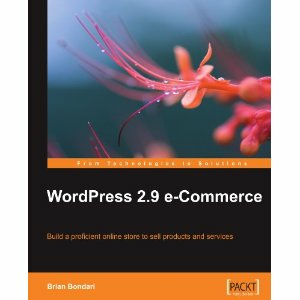 If you have never owned an online store before or are just trying to switch from your platform to WordPress, WordPress 2.9 E-Commerce can be a lifesaver.